Personal: Danny James (D.J.) Archer… Nicknamed “Tubby”… Enjoys watching and playing sports… Has a 20 handicap in golf…attended West Texas A&M, where he won the 2000 Collegiate Championship, and studied general business… Has a fear of flying… Lists Chris Rock as his favorite actor and Tiger Woods as his favorite athlete. 2019: Finished fourth in PBA Players Championship losing to Kyle Troup 194-193 in second stepladder match. Career: In 2018 had best finish of fifth in Roth-Holman Doubles for second consecutive year with Shawn Maldonado...Had best 2017 finish of fifth in Roth-Holman Doubles with Shawn Maldonado...In 2016 had three top 20 finishes in majors, 14th in Tournament of Champions, seventh in Players Championship and 10th in U.S. 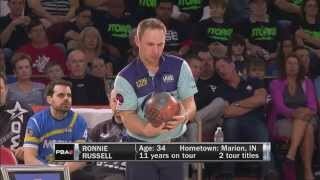 Open...In 2015 teamed with Bob Learn Jr. to win PBA/PBA50 South Shore Doubles for second PBA Tour win...Teamed with Shawn Maldonado to finish fifth in Roth/Holman Doubles losing to Dom Barrett and Osku Palermaa 237-179 in opening match...In 2014 won first PBA Tour title by capturing Chameleon Championship with 241-215 win over Ronnie Russell in championship match...Finished second for previous career high tour finish in 2013 Carmen Salvino Classic, losing to Andres Gomez in championship match 246-197...Also finished fifth in Viper Championship and sixth in Scorpion Championship in 2013...Owns two PBA regional titles... Finished fourth in the 2004 USBC Masters in Reno, Nev.losing in the stepladder finals to Mika Koivuniemi, 244-149.